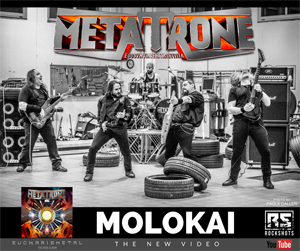 Italian power-prog Christian Metal Band METATRONE have released a new Video for "Molokai", a song taken from their latest album Eucharismetal, released in early 2016 via Rockshots Records. Check out the official video now on KNAC.COM right HERE. "This song is one of the strongest from the Eucharismetal album, the anger you can find comes out from the will against religious fanaticism of any catholic fringe which could be considered as pure secret societies where the person is set apart. So it ends to create a "creed" which lives for itself, breaking up human relationships".